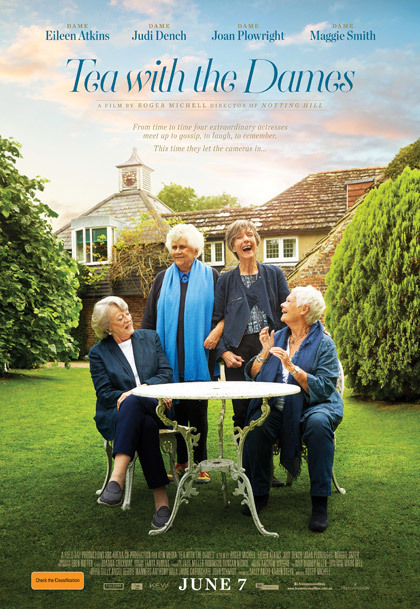 Tea with the Dames is a unique celebration of the lives and careers of four of our most iconic actresses; Dame Eileen Atkins, Dame Judi Dench, Dame Joan Plowright and Dame Maggie Smith. All four have gone from being fledgling actresses in the 1950s to acting royalty. They’ve watched each other’s careers grow and bloom and have celebrated life’s ups and downs together. Tea with the Dames invites you to spend time with these acting legends as they talk about their lives and their professional experiences across theatre, television and film. Directed by Roger Michell (My Cousin Rachel, Notting Hill), the film also includes a range of astonishing archive material. Candid, funny, caustic, irreverent, poignant and utterly engrossing, this unmissable release is proof that there is truly nothing like a Dame. M In cinemas from June 7. Thanks to Transmission Films, we have 5 double in-season passes to give away. For a chance to win, email us at info@ciaomagazine.com.au with the answer to one simple questions: What role do you think is Dame Judi Dench most well-known to movie-goers for? As often with our questions, there is no “correct” answer– we’re just seeing if you ever venture past the art-house into franchised espionage adventures (oops, that’s too big a hint!). Make sure you give us your name and postal address for the tickets. Entries close midday Monday June 4.